Alan Quinlan's hopes of touring with the British and Irish Lions are in doubt after he was caught on camera apparently eye-gouging Leinster captain Leo Cullen in today's Heineken Cup semi-final. Quinlan, the veteran Munster flanker, was a surprise inclusion in Ian McGeechan's 37-man squad and now faces an anxious wait to see whether the independent citing officer takes any action. Recent history, with cases involving Dylan Hartley and Neil Best, suggests that, if Quinlan is cited and subsequently found guilty, he could face a suspension that stretches into months. Neither Paul O'Connell, the Munster and Lions captain, nor Leinster coach Michael Cheika saw the incident in a ferocious game at Croke Park. But both provided positive character references for Quinlan. "Quinny isn't that type of guy," said O'Connell. "He is a tough player. It is the one thing he hasn't got in his record book. If it looked bad, I am sure there was nothing in it." After watching his side book their first Heineken Cup final appearance with a 25-6 victory, Cheika added, "Quinlan is a good operator and a good guy and I have a lot of respect for him. He is a hard guy. That is the battle. 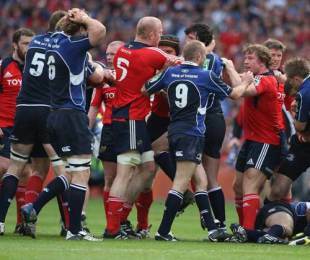 Between Munster and Leinster it is a war and you have to be as aggressive as you possibly can. I can't see him doing it." Leinster won the game with tries from Gordon D'Arcy, Luke Fitzgerald and man-of-the-match Brian O'Driscoll but the victory was founded on an aggressive defensive performance. Munster came into the game as odds-on favourites but were battered into submission and Leinster will head to Murrayfield on May 23 to face either Cardiff Blues or Leicester. "We stayed composed at the right times and defensively we were up to the task," said Cheika. "It is exciting we have got an opportunity to play in the Heineken Cup final. "We have had a good game today and done well and qualified for the final - but the final is not the prize. When we have got the trophy, they can't take that away from us. We haven't done it yet. We have won a semi-final and will have to go up against a team who are in red-hot form. We have to continue the belief we have." Munster coach Tony McGahan admitted he was "absolutely shattered" after an error-strewn performance and heavy defeat. "Words couldn't describe how difficult it is to take," said McGahan. "The Heineken Cup for Munster is everything and we were second best today and it will certainly hurt for a long, long time. The performance, the scoreboard and losing to Leinster obviously hurts. "We expected Leinster to produce their best game and today they didn't disappoint. They played on the back of a wonderful defensive display. It will take a very good side to turn them over."